Big Jim Wilkinson stood almost 200 cm tall—6 foot 5 inches in the old measure. He was proof that even remote Tasmanian mining fields attracted not just local prospectors, labourers, miners, engine drivers and other skilled workers, but international adventurers, men who flitted between gold rushes and boom towns, revelling in the lifestyle, but who eventually settled into the more stable support industries that underpinned every mining field. Wilkinson, who supposedly counted Australia’s first prime minister, Edmund Barton, and the poet, Adam Lindsay Gordon, as friends, had been an imposing figure on the Kalgoorlie goldfield, being ‘a big power with the miners … He is one of the most popular men in Kalgoorlie, and deservedly so. He has a head like a Roman senator…’ He hadn’t quite made it into the Australian Senate, being defeated in two campaigns in Western Australia. He was also said to have made ‘a prodigious impression’ in Gormanston, ‘with his Uncle Sam beard, his diamonds, his earrings, and his accent which was very good American for a Victorian native!’ He had discovered gold on the Murchison field, kept livery stables and attained legendary status as a coach driver in the early days of the Silverton-Broken Hill silver field by keeping his passengers—or his horses, if he was carrying only freight—awake through the night with recitations of Gordon’s verses. He had been a pearler, a guano dealer in south-east Asia, a race handicapper and a hotelier. Alma’s inscription on Jim’s grave at Balfour. However, none of that counted for anything at Balfour, where Wilkinson achieved another distinction entirely—he was the first interment in the cemetery, in January 1910, after only one month in town. He had come to Balfour to run a hotel for his brother-in-law, the ubiquitous jack-of-all-trades Frank Gaffney. Wilkinson arrived as a diabetic, in a shanty town that had no resident doctor. Nor was there a minister to officiate at his grave. Like typhoid victims Haywood and Tom Shepherd before him, he died when there was no tramway from Temma. His grave relics—with their emphatic tale of loss and devotion—must have been hauled in from Temma by horsepower at least a year after his death. For more than a century, Big Jim Wilkinson, bright star of the boom-time, has rested in obscurity on one of Australia’s most obscure mining fields, leaving us to ponder the levelling power of death and the burning question—who was Alma? *With thanks to Val Fleming. ‘Language freaks’, Critic (Adelaide), 26 March 1898, p.5. ‘Gormanston notes’, Zeehan and Dundas Herald, 27 October 1903, p.4. See, for example, Randolph Bedford, Naught to thirty three, Currawong Press, Sydney, 1944, pp.98–100. See, for example, ‘Death of Mr JJ Wilkinson’, Kalgoorlie Western Argus, 1 November 1910, p.15. ‘Resident doctor’, Examiner, 10 January 1910, p.5. Sylvia McArthur’s slab in the ground litter at Balfour. Grave of William Murray. Photo by Val Fleming. 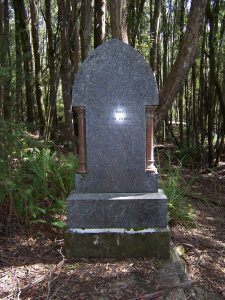 The story of Balfour is told by two graves in a highland cemetery in north-western Tasmania. For more than a century, lying side by side, William Murray and Sylvia McArthur have been fixed silently in their interlocking roles in what historian Geoffrey Blainey called the ‘Indian summer’ of Tasmania’s first mining boom. There is an interesting dynamic between these two people, who were interred on consecutive days in November 1912. William Murray was a 51-year-old husband and father of two, Sylvia McArthur a 15-year-old schoolgirl. He has Doric columns on his granite headstone, which is reputed to have been sent out from Scotland. She has a slab from J Dunn and Co, Launceston, and, as their graves suggest, they represented different social strata. As one of the owners of the principal mine, the Copper (Murrays’) Reward, William Murray was from the big end of town, living in what was once called ‘the mansion’. Sylvia McArthur was part of the globe-trotting fraternity of mine workers, the community that follows the speculators, grounded in the realities of remote mining towns a century ago, physical and cultural isolation, poor sanitation and health care. Sylvia would have lived in a corrugated iron hut, one of those described as looking like ‘opened out sardine cans’. She is believed to have died of typhoid. William Murray died by putting a gun to his temple, reputedly because of financial and marital collapse stemming from the Copper Reward mine. So, in different ways, they were both casualties of Balfour’s frenzied mining speculation. Sylvia McArthur’s story begins with the marriage of William McArthur, one of nine children born to Scottish bounty immigrants, to Catherine Dolan, the daughter of Cygnet farmers. They married in Zeehan, where he was a miner and she a housemaid. Two of William’s brothers, Robert and John, likewise followed the mining profession wherever there was work. 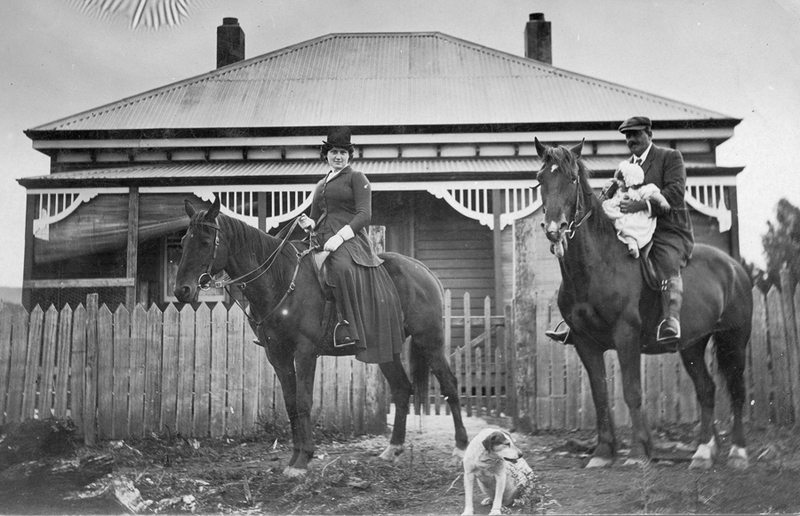 At Zeehan in 1897 Catherine produced their second daughter, Sylvia Iris McArthur. Emphatic endorsements of the Mount Lyell copper boom were then rising in Queenstown, Strahan and Zeehan. Built on a grand scale in 1898, Zeehan’s Gaiety Theatre and Grand Hotel had a stage larger than that of Hobart’s Theatre Royal and more seating than Hobart’s Town Hall. 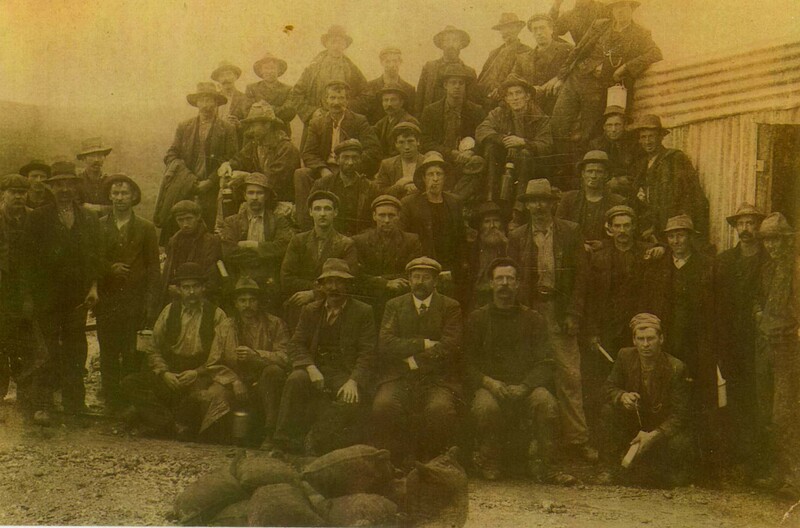 Zeehan’s silver mines had also peaked, but the field was beset by shallow lodes and problems of ore treatment. Catherine and William McArthur at Zeehan with their first three daughters, Florence, Sylvia and Gladys. Mora Studio, Zeehan, photo courtesy of Edie McArthur. When love has bound the heart. We for a time must part. Till we see thy heavenly face’. 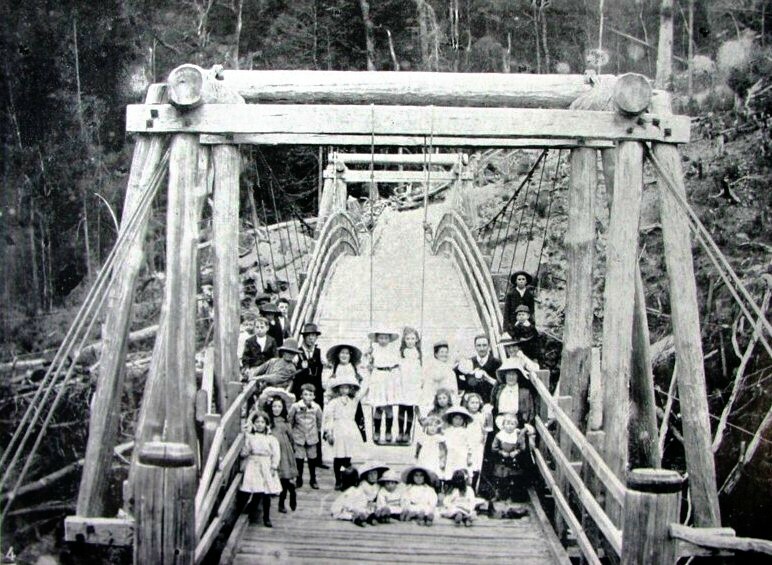 By 1908, when William re-married, and with 20-year-old Marion May Delaney started adding boys to his four girls, Zeehan was in decline. 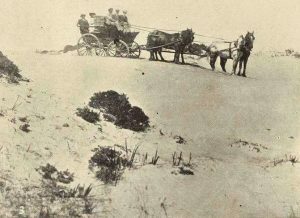 The Balfour coach negotiating a sand dune. Photo by Fritz Noetling from the Tasmanian Mail, 9 March 1911, p.24. The new boom town was Balfour. It was remote even by mining field standards, a shanty town lodged somewhere between Circular Head and the ‘true’ west coast. No road, railway or deep-water port served it. The Balfour coach could be bogged in beach sand or swamped by the Southern Ocean. 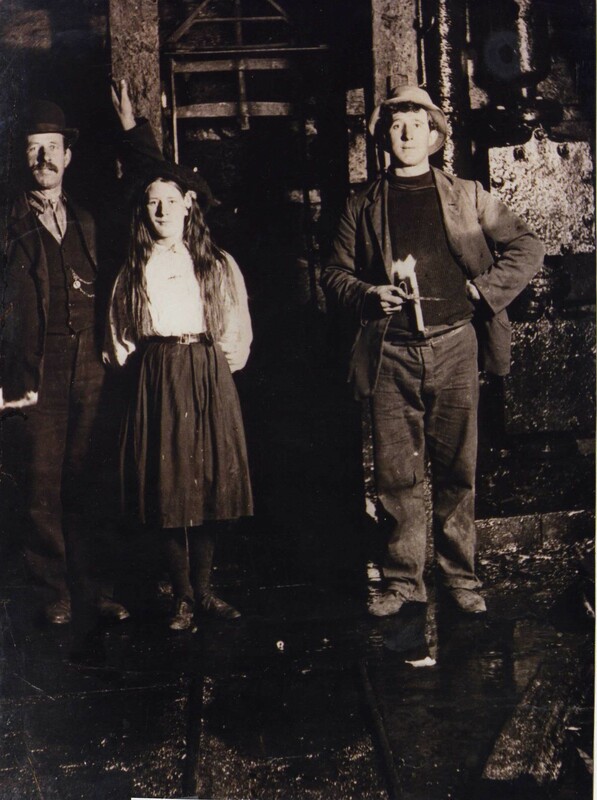 Yet by the spring of 1909, investors were agog at the 1100 tons of ore, averaging about 30% copper, which the brothers William and Tom Murray had somehow dispatched to market. In October 1909 a report circulated that the Murrays had sold their Copper Reward mine for £50,000—a claim they denied. The Balfour copper field was soon being hailed as a second Mount Lyell. By October 1911 William McArthur had secured the position of engine driver at the Copper Reward. 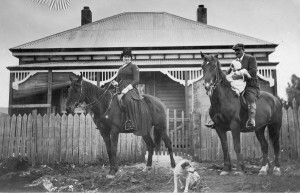 It took his family a fortnight’s travel from Zeehan via Burnie and Stanley to join him at Balfour. Rough weather held up their voyage on the ketch HJH, forcing passengers ashore five kilometres from the Woolnorth stock station. Finally, a four-hour ride on the new horse-drawn Temma-Balfour tramway delivered the family to its remote new home. Balfour had already suffered the obligatory typhoid epidemic of the early life of a mining town by the time fourteen-year-old Sylvia McArthur arrived. The Circular Head Council apparently did not take much notice of this, because it afterwards suggested to the Balfour Advisory Board that it dump the town’s nightsoil in the Frankland River, presumably downstream of the local recreational area and fishing hole. A sanitary inspector despatched to Balfour after the typhoid outbreak found only one unsanitary drain at the Balfour Hotel, plus the suspicion that a pig was being kept on that premises—apparently in anticipation of King George V’s coronation in June 1911, when it was patriotically sacrificed. William Murray was out of town at that time. Having taken an eighteen-year-old bride, the forty-eight-year-old was honeymooning in England. In August 1911, when Hazel and baby Jean Murray saw Balfour for the first time, they took up residence in what one man called the ‘mansion’, perhaps the only house in town blueprinted by an architect. Perhaps the Murrays also had acetylene lighting, which would have placed them ahead of the underground miners in the candle-lit Copper Reward. 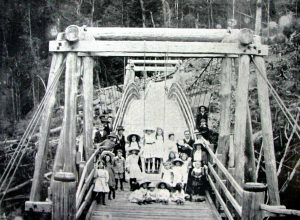 The McArthur family and friends on the Frankland River bridge, with Sylvia at back (left) in the wide-brimmed hat. 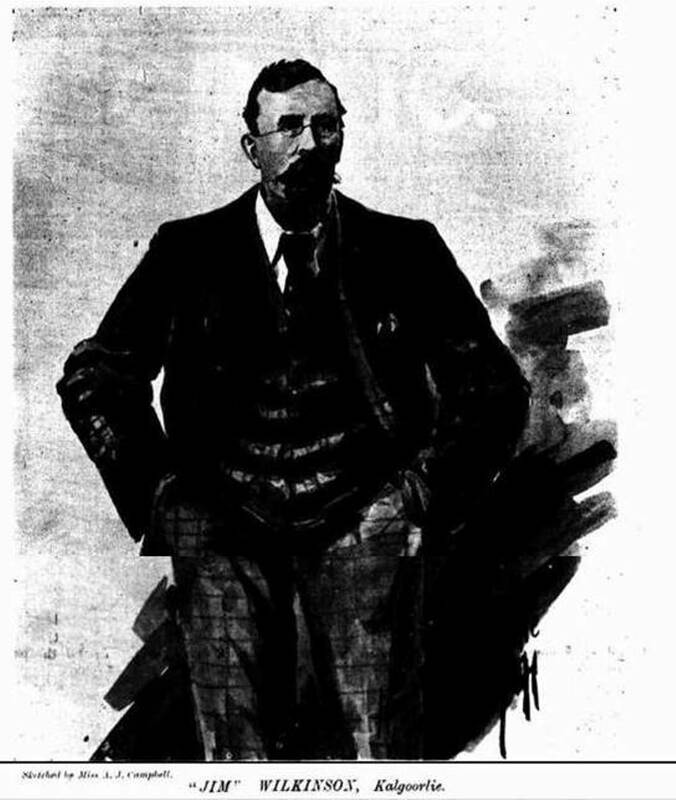 William McArthur photo from the Weekly Courier, 18 April 1912, p.17. The same picnic party at the river. William McArthur photo from the Weekly Courier, 18 April 1912, p.17. The McArthurs began to live their life in the social pages in January 1912, when Sylvia wrote her first letter to the Weekly Courier newspaper. It is through her words and her father’s photos that we get the story of everyday life in a remote settlement. Sylvia went from a very large school at Zeehan to a one-teacher operation of 23 students at Balfour. She stopped attending because there were no girls of her own age, and she felt as lonely at school as she was at home. Instead, she carried her father’s crib to the mine and looked after her younger siblings. Her sisters became schoolteachers, and Sylvia’s own love of small children is very evident. For amusement she collected postcards and read copiously. 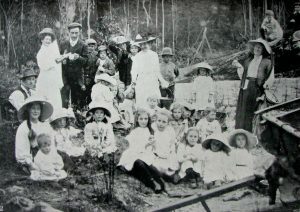 The Christmas sports and picnic was the highlight of the social calendar. There was also a dance every few months to the tune of a piano accordion. Sylvia enjoyed the fern gullies and glades of the nearby Frankland River, a favourite picnic spot where walks were taken and the blackfishing was lively. 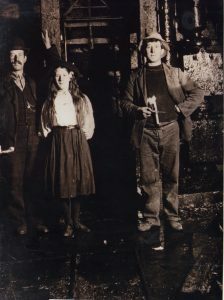 William and Sylvia McArthur pictured with an unknown man (right) underground in the Copper Reward. Photo courtesy of Edie McArthur. ‘It was the first time I had been down a mine. I think it is a funny feeling one has whilst going down in a cage … Whilst I was down below a gentleman took a flashlight photograph of us. We all looked like ghosts, for our faces were so white. However, I would not like to leave Balfour without being able to say I was down a mine’. In her final letter to ‘Dame Durden’ of the Weekly Courier in October 1912, Sylvia described a concert given by the Balfour schoolchildren, illustrated, as usual, by her father’s pictures. Her fatal illness may have been brewing even as the newspaper went to press. By the tender cords of love. Where you sleep for evermore’. Ferns and dogwood still guard William Murray and Sylvia McArthur’s final resting-place. In fact the scrub has grown up so much that the cemetery’s river view has been lost. The ‘lonely spot near Balfour’, as William McArthur described it, is lonelier than ever. ‘Mount Balfour’, Circular Head Chronicle, 9 February 1910, p.3. See, for example, Heather Nimmo’s play ‘Murrays’ Reward: a play in two acts’. Thanks to Edie McArthur for help with McArthur family background. For Catherine Dolan, see birth registration no.1352/1877, Cygnet, to Thomas Dolan and Agnes Dolan, née Harrison. Marriage registration no.838/1895, Zeehan. Catherine gave her age as 18 but she was only 17; William was 28. Thanks to Edie McArthur for help with McArthur family background. She was born 16 October 1897, registration no.3194/1897, Zeehan. ‘Gaiety Theatre’, Zeehan and Dundas Herald, 1 November 1898, p.4. Editorial, Zeehan and Dundas Herald, 23 July 1904, p.2; memorial to Catherine McArthur, held by Edie McArthur. ‘Mining’, Mercury, 26 October, p.3; and 4 November 1911, p.2. ‘The far north-west’, North Western Advocate and the Emu Bay Times, 7 February 1911, p.2. Sylvia McArthur; in ‘Dame Durden’, ‘Young folks’, Weekly Courier, 11 January 1912, p.3. See ‘Balfour’, Circular Head Chronicle, 21 December 1910, p.2; and 18 January 1911, p.3. For the pig suspicion and the unsanitary drain, see ‘Balfour’, Circular Head Chronicle, 21 December 1910, p.2 and Circular Head Chronicle, 29 March 1911, p.2 respectively. For the pig slaughter, see the exchange of poems by JW Lord (‘Breheny’s pig’, Circular Head Chronicle, 21 June 1911, p.2 and 26 July 1911, p.4) and ‘Daybreak’ (Clement Lewis Gray), ‘RIP’, Circular Head Chronicle, 5 July 1911, p.3. ‘Social news’, Star (Sydney), 29 January 1910, p.16. ‘Mount Balfour’, Circular Head Chronicle, 9 February 1910, p.3; TB Moore diaries, 30 April 1912, ZM5641 (Tasmanian Museum and Art Gallery). Sylvia McArthur; in ‘Dame Durden’, ‘Young folks’, Weekly Courier, 13 June 1912, p.3. Sylvia McArthur; in ‘Dame Durden’, ‘Young Folks’, Weekly Courier, 1 February 1912, p.3; 13 June 1912, p.3; 18 July 1912 p.3; 3 October 1912, p.3; Mavis McArthur; in ‘Dame Durden’, ‘Young Folks’, Weekly Courier,18 July 1912, p.3. Sylvia McArthur; in Dame Durden, ‘Young folks’, Weekly Courier, 3 October 1912, p.3. E Payne, ‘Balfour mine’, Examiner, 19 March 1951, p.2. The Circular Head Chronicle (‘Deaths at Balfour’, 6 November 1912, p.2) reported merely that Murray had ‘died suddenly’. The coroner found that Murray died of a self-inflicted ‘gunshot wound to the head … while of unsound mind’ (see SC195-1-82-13112, [TAHO]). She died 5 November 1912, registration no.652/1912, Montagu. See also ‘Deaths at Balfour’, Circular Head Chronicle, 6 November 1912, p.2. The official record places her death 10 days later. No inquest was conducted. Poem by William McArthur published in Dame Durden, ‘Young folks’, Weekly Courier, 21 November 1912, p.3. 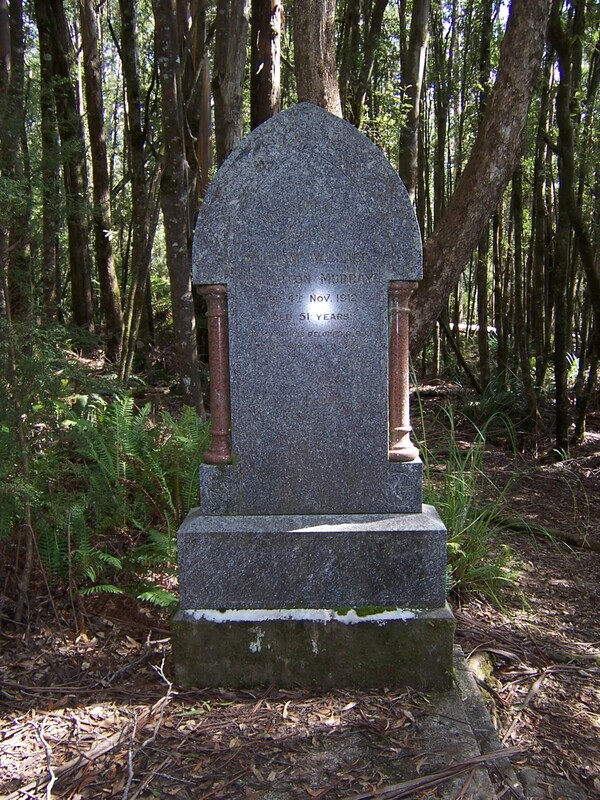 The story of Balfour is told by two graves in a highland cemetery in north-western Tasmania. For more than a century, lying side by side, William Murray and Sylvia McArthur have been fixed silently in their interlocking roles in what historian Geoffrey Blainey called the ‘Indian summer’ of Tasmania’s first mining boom. Why did they ever live in this remote place? They were both casualties of frenzied speculation that Balfour would become a second Mount Lyell copper field. Part one of this story concerns William Wallace Fullarton Murray junior (1861–1912), manager of the Copper Reward (Murrays’ Reward) mine which generated this excitement. He received a fighting pedigree from both parents. William Murray’s paternal grandfather, a captain in the 91st regiment, was reputedly a hero of the Battle of Trafalgar. His father, William Wallace Fullarton Murray senior (1820–94), a Church of England minister, was brought to Tasmania from England to tutor the children of Governor Sir William Dennison, after which he served as chaplain of New Norfolk (St Matthew’s Church) for 39 years. William senior married Augusta Schaw, the sixth daughter of Major Schaw, a police magistrate formerly of the 21st Fusiliers. Such an impressive lineage demanded a private school education, which young William and his brother Thomas Charles Murray (1862–1938) received, but their upbringing, along with that of their six sisters, was relatively modest. Although Tom was a mad-keen prospector, it was actually their sister Kate who led the Murray brothers to what became known as the Copper Reward mine near Mount Balfour, far from their home town of New Norfolk. Kate married William Wilbraham Ford, a Circular Head farmer, who grub-staked a prospector, Frederick Henry Smith. Smith discovered copper on Tin Creek near Mount Balfour, which had been a sparsely-visited alluvial tin field for two decades. In 1901 Tom Murray helped him peg the discovery and applied for a reward claim under the Mining Act (1900). Tom and William Murray, Fred Smith and William Ford took a quarter share each in the mine, Ford apparently helping to finance and promote its development. The remote claim was not surveyed until 1905, by which time Smith’s whereabouts were unknown. The lease was finally issued in 1907 to Tom Murray and in trust for others interested. 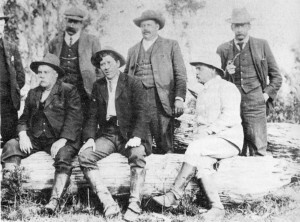 Having abandoned their unprofitable gold leases at Woody Hill near Queenstown, the Murray brothers worked their reward claim continuously from February 1907. To relieve financial pressure a fifth share in the mine (rumoured to be Robert Sticht, general manager of the Mount Lyell Company) was introduced. The Murrays built a farm—now known as Kaywood—with an extensive vegetable garden near the hazardous port of Whales Head (Temma). Six-horse wagons delivered ore from the mine to the brothers’ store shed at Temma, awaiting the fortnightly visits of the auxiliary ketch Gladys which bore it to market. Without even a jetty, loading and offloading at Temma involved a rowboat meeting a dray driven into the water. 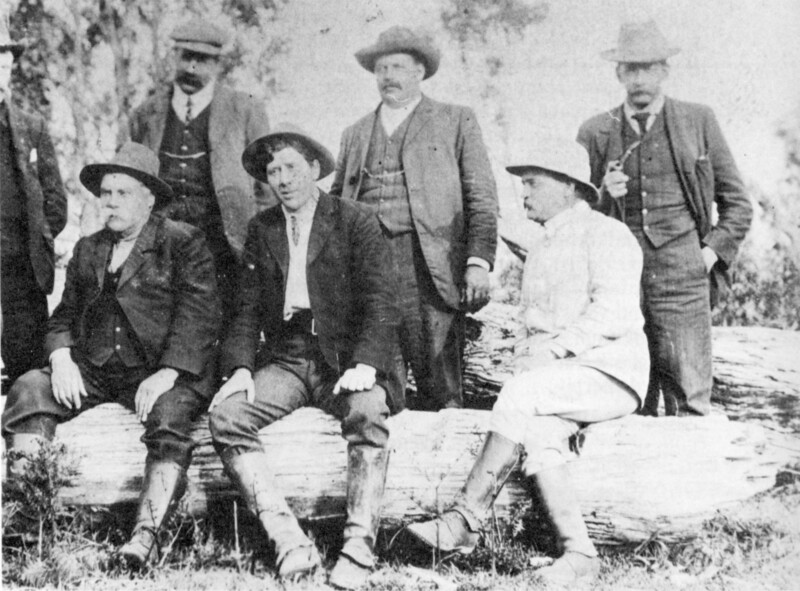 Tom and William Murray (centre at back), with Thomas Bather (TB) Moore seated at front on the left, Balfour, 7 November 1909. The others include Speedy, Dunne, surveyor KM Harrisson, and Inspector Harrison Langford (see TB Moore diaries, TMAG). By the spring of 1909, investors were agog at the 1100 tons of ore, averaging about 30% copper, which the Murrays had reportedly dispatched. In addition, three or four times as much high grade ore was said to have been ‘at grass’ on the property. In October 1909 a report circulated that the brothers had sold the Copper Reward mine for £50,000 and an interest in a company with a big working capital—a claim the Murrays denied. Meanwhile a township named after nearby Mount Balfour developed. The workforce of the Copper Reward mine, with William Murray centre at front, and engine driver William McArthur seated to his left. Photo courtesy of Edie McArthur. The entire mining field appears to have been invigorated by developments at the Copper Reward. Mount Lyell was stamped all over the speculation boom that followed. The Central Mount Balfour Company, with Mt Lyell Co directors Aloysius Kelly and Herman Schlapp in prominent roles, was floated in Melbourne with £25,000 subscribed capital. The adjoining Balfour Blocks Company had Mount Lyell supremo Bowes Kelly as chairman of directors. Meanwhile, veteran prospector and explorer Thomas Bather (TB) Moore dug away at the Norfolk Ranges at the behest of his boss, Robert Sticht. In May 1910 the first sod was turned on the Stanley to Balfour Railway, a farcical grab at timber and hydro-electric power concessions by the Melbourne promoters of the Mount Balfour Copper Mines NL, now styling themselves the Mount Balfour Mining and Railway Company—mimicking the Mount Lyell Mining and Railway Company. Hazel and William Murray in front of their ‘mansion’ at Balfour, 1911, with daughter Jean. Marital bliss or a façade for the photographer? Photo 1997:P:5591, QVMAG, Launceston. It must have been tempting for the Murray brothers to start living the good life that the speculation promised, and which could easily have landed them in debt. Forty-eight-year-old William took an eighteen-year-old wife, Melbourne-born Hazel, née Myers (1891–1973). Married in Sydney, the couple honeymooned first at Jenolan Caves, then in England while their Balfour home was built. The Circular Head Chronicle noted that the house, with its concrete double chimneys, would provide ‘a magnificent contrast to our present canvas and paling humpies, to say nothing of those described by a recent visitors as being made of opened out sardine tins’. TB Moore referred to the Murrays’ house as ‘the mansion’. It is possible that Hazel Murray wasn’t quite so impressed with it when, in mid-1911, following on from their antipodean jaunt, William brought his young bride, baby and maid to Balfour via stage coach and the new horse-drawn tramway from Temma. How happy the couple seems in the photo, with Hazel astride her horse, and William clutching their first daughter, Jean Wallace Murray. Did Hazel adjust to frontier living, or did she ‘fly’ back to ‘civilisation’? The fate of the Murray brothers is a staple of Tasmanian mining folklore, even being the subject of a play. William Murray shot himself in his home at Donald Street, Balfour, in November 1912, reputedly as part of an unfulfilled double suicide pact with his brother Tom. William was a quiet and private man: only he would know why he suicided. In her description of William and Hazel Murray’s wedding, the social writer for the Star newspaper referred to the brothers by their second names, Wallace and Charles: perhaps they had new social pretensions in Sydney. Had the Murrays missed their big chance to sell the mine, had dreams of marriage and riches crashed? It has been claimed that they refused an offer of £30,000 for a mine that ultimately proved a failure. However, it had not failed at the time of William Murray’s death, and the copper price was starting to recover from the 1907 crash. It was sadly appropriate that William’s death was overshadowed by the tragedy of the North Mount Lyell fire, which killed 42 miners. William Murray bequeathed Hazel his life insurance policy to the value of £250—providing death by suicide was covered. She would not have been able to claim on an accident policy to the same value. She also received half the value of his mining interests, the other half being divided between his brother Tom Murray and others. Perhaps debts absorbed all this and more. In 1913, 22-year-old mother-of-two Hazel was operating a boarding house at Battery Point, Hobart, but later she appears to have returned to her family. Little is known about her life in Sydney. Her second daughter, Mary Fullarton Murray, married in 1937, but the other, Jean, had an unhappy love affair, suing her lover for £1000 in 1942 for breach of marriage contract. Tom Murray reputedly suffered a mental breakdown after his brother’s suicide, although he was apparently fit enough to walk from Hobart to Balfour to tend William’s grave. Certainly he seems to have led a listless life, returning to Balfour in 1916 and 1920, then selling up his farm at Forest in 1924 with the intention of leaving the state. Tom hunted osmiridium at Adamsfield two years later. Described as having ‘no occupation’ and being ‘late of Roger River’, he died intestate at Latrobe in 1938, aged 75. 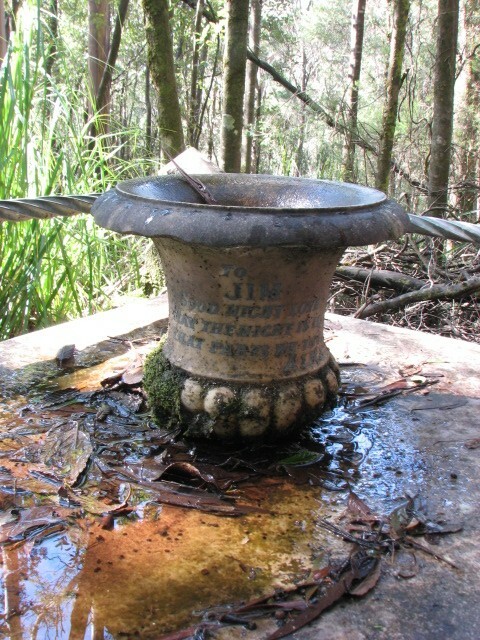 The Copper Reward mine remains untested at depth. The Tasmanian Pioneers Index records that William Wallace Fullarton Murray senior and Louisa Augusta Schaw married at Richmond, Tasmania, in 1851 and produced five children at New Norfolk, Louisa Augusta Murray (born 1854), Mary Wallace Murray (born 1857), Eleanor Carter Murray (born 1859), then the two boys. William Wallace Fullarton Murray junior’s birth, recorded without given names, was 23 April 1861 (RGD33, 1664/1861). 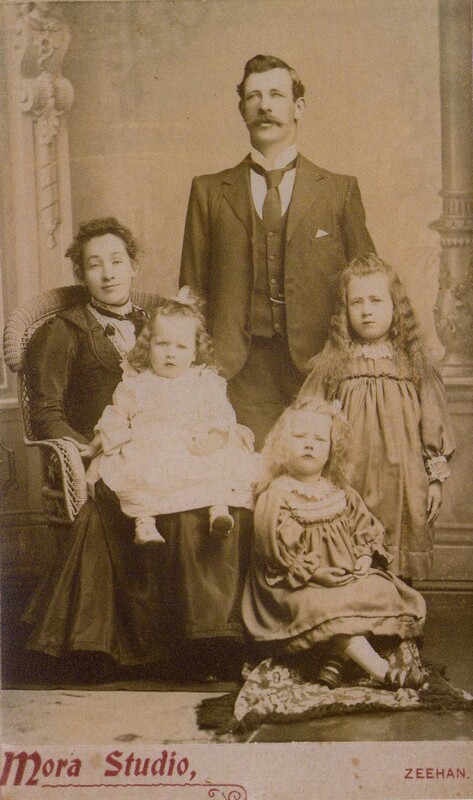 Thomas Charles Murray was born 5 October 1862 (RGD33, 1188/1862). However, the author of ‘The Late Rev WWF Murray, MA’, Church News, October 1894, p.156, records that he was survived by six girls, two of them married, and two unmarried sons. Valentia Kate (Kate Valencia) Murray (died 1948) married William Wilbraham Ford at Hobart in 1897, registration no.270/1897. For Ford as Smith’s grub-staker, see ‘A Balfour mining case: decision reserved’, Circular Head Chronicle, 10 August 1910, p.2. For WW Ford as promoter, see ‘Mt Balfour Copper Mines’, Circular Head Chronicle, 15 April 1908, p.2, in which Ford invites the newspaper’s reporter to the mining field as a guest of the Murray brothers. ‘A Balfour mining case: decision reserved’, Circular Head Chronicle, 10 August 1910, p.2. For William and Tom Murray’s gold leases, see Queenstown Assessment Roll for 1908, Tasmanian Government Gazette, 15 October 1907, p.1504. Tom Murray was then the owner/occupier of a cottage in Peters Street, Queenstown (p.1497). The Tasmanian Post Office Directory for 1907 (p.437) and 1908 (p.439) lists both Murrays as ‘mine owner, Queenstown’, whereas the 1909 edition (p.417) has them both as ‘mine owner, Mt Balfour’. ‘A Balfour mining case: decision reserved’, Circular Head Chronicle, 10 August 1910, p.2. In 1910 the Court of Mines adjudicated that Smith’s one-fifth share now belonged to Ernest Plummer and James Loftus Wells of Stanley (a one-tenth share each), to each of whom Smith had sold half his interest before he disappeared (‘Murray’s [sic] Reward Mine: Balfour mining action’, Circular Head Chronicle, 31 August 1910, p.2). A Murray brothers appeal to the Supreme Court in 1911 overturned this decision, denying Plummer and Wells any interest in the Murrays’ Copper Reward mine (‘A mining dispute: the Murray Reward claim: judgment for defendants’, Circular Head Chronicle, 3 May 1911, p.2). ‘Mount Balfour’, Circular Head Chronicle, 13 July 1910, p.3. See TB Moore diaries for 1908 and 1909, ZM5640 (Tasmanian Museum and Art Gallery [hereafter TMAG]). ‘The Balfour Railway: turning the first sod’, Circular Head Chronicle, 10 May 1910, p.2. ‘Personal’, Circular Head Chronicle, 19 January 1910, p.2. TB Moore diaries, 30 April 1912, ZM5641 (TMAG). ‘Balfour: general news’, Circular Head Chronicle, 30 August 1911, p.2. Did the maid hand the baby over to her father so that she could take the photo? The play is Heather Nimmo’s ‘Murrays’ Reward: a play in two acts’. ‘Deaths at Balfour’, Mercury, 7 November 1912, p.4; death notice, Mercury, 20 November 1912, p.1. The Hobart Assessment Roll for 1913 places her as a tenant in De Witt Street, Battery Point (Tasmanian Government Gazette, 8 December 1913, p.2426). ‘Out of town news’, Sydney Morning Herald, 9 March 1937, p.3; ‘Woman to receive £1000 damages’, Sydney Morning Herald, 8 September 1942, p.7. For Tom’s reputed mental breakdown see, for example, Kerry Pink and Annette Ebdon, Beyond the ramparts: a bicentennial history of Circular Head, Tasmania, Circular Head Bicentennial History Group, Smithton, 1988, p.249. For Tom’s return visits to tend William’s grave, see Joan Foss, Memories of the Marrawah Sand Track (held by Circular Head Heritage Centre, Smithton). Tom Murray reportedly asked to be relieved of the management of the Copper Reward in 1913 because of ill health (‘The Balfour field’, Circular Head Chronicle, 17 December 1913, p.2). ‘Mining’, Mercury, 13 June 1916, p.3; ‘Personal’, Circular Head Chronicle, 30 June 1920, p.3; advert, Advocate, 3 May 1924, p.8. ‘Forest’, Circular Head Chronicle, 14 July 1926, p.5. ‘Deaths’, Mercury, 16 August 1938, p.1. Probate was valued at only £168, see AD963-1-3-2352 (TAHO). He was buried at Cornelian Bay Cemetery, Hobart. An Examiner correspondent later claimed that Tom Murray ‘just sold me the machinery and left’, predicting that ‘we have not heard the last of Balfour yet’ (E Payne, ‘Balfour mine’, Examiner, 19 March 1951, p.2).